I can’t say enough good things about Bonobo. Like many, many, many of my favorite musicians I first heard him through monkeyradio.org. Though the stuff on monkey radio, at the time, was his older stuff. At that time his newest album was Black Sands, and the moment I heard that album I knew I’d be listening to Bonobo for some time to come. Like many artists, each of his albums has a very unique sound, that doesn’t necessarily carry over to his next album. Below I will try to post some songs that represent all of his styles. Simon Green (born 30 March 1976), also known by his stage name Bonobo, is a British musician producer and DJ. 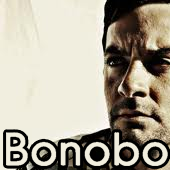 Bonobo uses a wide variety of samples in his music combined with heavy, often complex basslines. His music generally develops linearly – with new elements such as basslines or percussion coming in one after the other. In Days to Come, he mixes this sonic background with the clean yet distinctive vocals of Bajka, who often uses harmony to build up a multifaceted sound.